An illustration of a dust trap around a star. 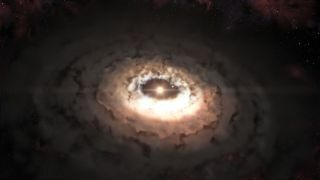 A mysterious object lurking near the young star Oph IRS 48 could, along with observations of dust grains, change our understanding of planet formation, astronomers said. Observations of the system revealed a "dust trap" of millimeter-size grains on one side of the star, with smaller micrometer-size particles spread evenly throughout the disc. The particles, astronomers said, could eventually clump into a "comet factory" producing kilometer-size rocks such as those found in the Kuiper Belt outside Neptune's orbit. Nienke van der Marel, a Ph.D. student at Leiden Observatory in the Netherlands, said the researchers’ original plan was to analyze the gas. However, "We received the data and said, 'What is it? That's not what the disc is supposed to look like!'" she told SPACE.com. The signal found by the Atacama Large Millimeter/submillimeter Array (ALMA) in Chile was strong enough to rule out a false positive, she added. With the data in hand, van der Marel's team theorized that what they were observing could help explain how dust grains grow over time to become the beginnings of planets, called protoplanets. Young star systems are a mess of dust and debris. Conventional planet-forming theory posits that the dust eventually sticks together and grows, forming larger and larger objects until they reach the size of planets (in the case of rocky planets) or planetary cores (in the case of gas giants, such as Jupiter). There's a "radial drift" problem with the theory, however, that has persisted among astronomers for a generation. Within the disc surrounding the star, there is higher pressure closer to the star and lower pressure farther away. Due to this pressure gradient, gas and small, micrometer-size particles have slightly slower orbital velocities around the star. When the millimeter-size bits grow, they begin to experience friction with gas and smaller particles. Eventually, the larger particles slow down themselves. When the friction drops their speed below a certain threshold, they drift toward the star and are annihilated. "That radial drift is happening on a very short life scale compared to the life scale of the disc," van der Marel said. "The grains quickly disappear and spiral into the star." Enter the dust-trap theory: If there were a way to form an environment for the dust to grow, perhaps it could solve the radial-drift problem. This has been theorized before, but never directly observed. In the case of Oph IRS 48, the astronomers think that an object with a mass 10 times that of Jupiter is forming vortices at the edge of the system, creating an area of high pressure that balances out the high pressure near the star. Pinned between these two high-pressure areas, the dust grains hover, stick together and eventually grow. The grains are too far away from this star to form planets — their density is low, as they're in a region that should be made up mostly of ice, according to planetary-formation theories. They could, however, become icy, 1-kilometer-wide objects in time, similar to what is seen in the Kuiper Belt in Earth’s solar system. This belt is believed to be the spot where many comets are born. There is a chicken-and-egg problem that is bothering some astronomers: How did that massive, mysterious object in Oph IRS 48 form? "One question for the future is whether the sort of trapping processes that we see in this object would also be present at earlier times, and could potentially have created the massive planet that is partially responsible now for creating this other trap," said Phil Armitage, a theoretical astrophysicist at the University of Colorado in Boulder who wrote an analysis of the paper in the journal Science. He said the dust-trap theory has been around for a while, but few astronomers suspected it would be so obvious in an image. "[To be] so large that you can directly observe — that is quite a surprise," Armitage said. Van der Marel's paper was published today (June 6) in the journal Science and includes input from researchers from the Netherlands, Germany, Chile, China, Ireland and the United States. The researchers hope to use ALMA to examine other star systems for the same phenomenon. The telescope is designed to examine dust grains in young star systems, and was officially inaugurated this year.